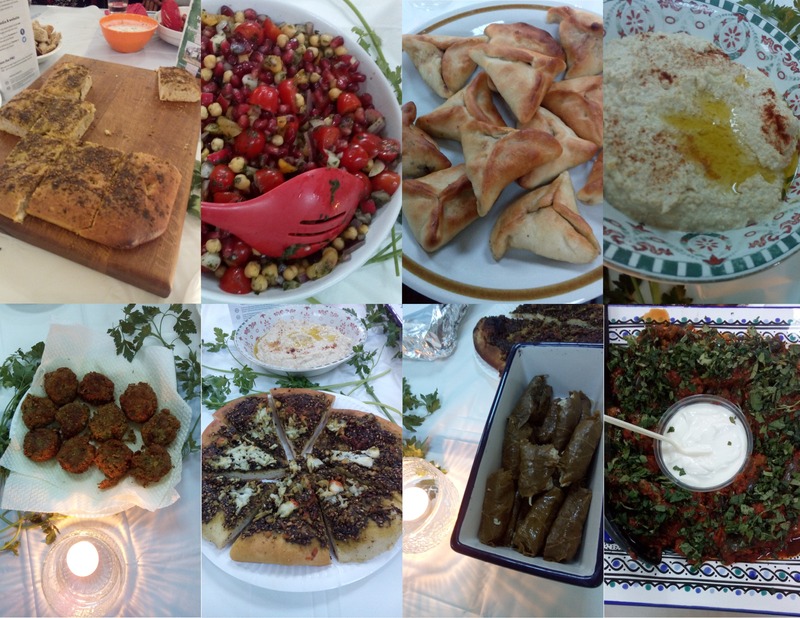 We enjoyed an eyepopping and mouthwatering feast at last night’s second Palestinian Kitchen event in Faversham, as well as a selection of speakers and a fascinating display of photographs. 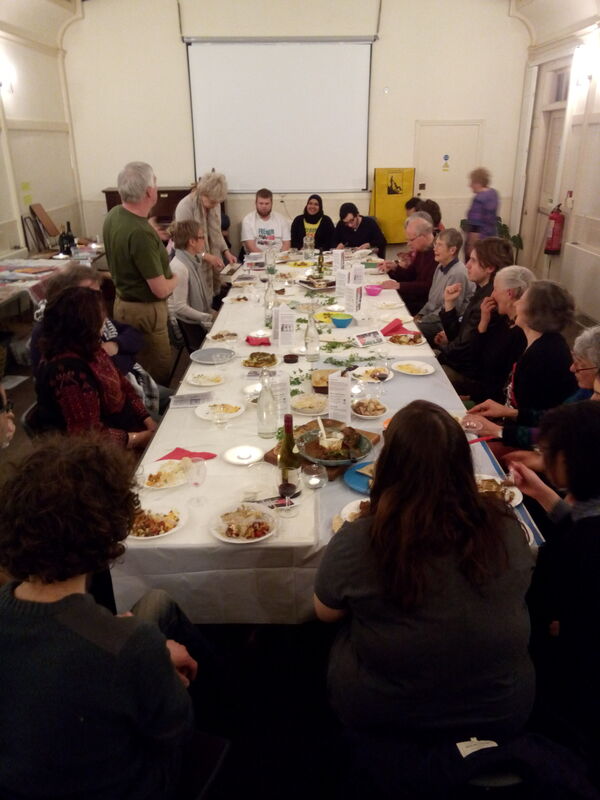 Between 30 and 40 of Faversham & Whitstable PSC’s friends and supporters got together in the Fleur de Lis hall, with many bringing Palestinian fare they had prepared themselves. We were delighted to be joined by new friends who travelled from as far away as Folkestone; by University of Kent Palestine Solidarity group students who were dedicated enough to travel through from Canterbury after their own meeting; and even by the chair of Edinburgh’s PSC branch. Speakers included local supporter John, from Ospringe, who told us about his recent volunteering in the West Bank, planting olive trees. 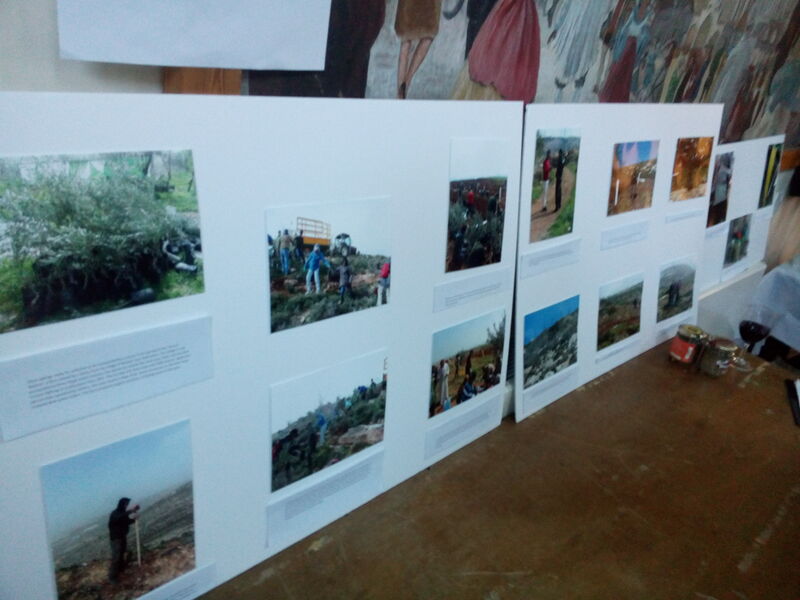 Another local supporter talked us through his display of photographs showing both Palestine’s culinary culture and dishes as well as the production process of olive oil and the hurdles facing Palestinian food producers. The chair of Edinburgh’s PSC told us how the branch there had seen a huge increase in membership following last year’s assault on Gaza, and told us how the group had been targeting branches of Barclays in cheeky and creative ways, protesting against its investments in companies profiting from Israeli apartheid. Local activist Marika told us about her nephew’s good work, with other doctors, bringing medical help to Palestine – despite having their medical equipment confiscated by Israeli security. And we welcomed Anna, the new president of Kent University’s Palestine group, who filled us in on the events they held to mark Israeli Apartheid Week. We also slotted in our first and informal AGM, as we take steps to properly constitute ourselves, building on our success so far and our growth from our original small group of energetic organisers. We’ll be holding a more formal AGM in the coming year. We raised at least £60 in donations and raffle tickets on the night, plus donations towards hire of the hall. And we’ll be putting the money towards a new and updated leaflet for the group to help us continue spread the word and gather support.